Pedal with folks from around the world through Honolulu’s trendy arts and warehouse district, Kaka'ako, located on the outskirts of Waikiki. Your guide will steer the bike built for 15 through Kaka'ako stopping at the most popular POW! WOW! murals. Enjoy lunch and a pint at Honolulu Beerworks or local brewery on this all-inclusive 2-hour journey with optional hotel pickup and drop off (Select Waikiki Hotels). Munch, chomp, gulp, and sip your way through Honolulu on this fun and fresh new way to see the city’s trendy arts and warehouse district, Kaka’ako. On this pedaling journey, stop at the innovative and dynamic ART of POW! WOW! Hawaii which has been held in Honolulu since 2011. POW! represents the impact that art has on a person and WOW! represents the reaction that art has on a viewer. Pedal in awe as artists from around the globe have decked out the warehouses in amazing murals! 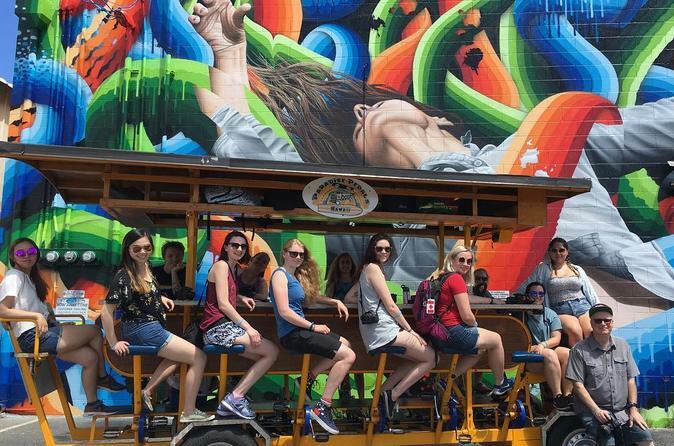 So, sit back, relax and enjoy this cultural and artistic immersion into one of Honolulu’s most creative neighborhoods while also getting to enjoy lunch and a pint at Honolulu Beerworks or another local brewery which are fully included in this two-hour tour.